These Womens Below-the-elbow(8BL) Length Velvet gloves are one size fits all because of the stretch quality and easy to wear and comfortable. This is a slip on glove, there are no buttons. Approximately 15.5" in length from the tip of the middle finger to the end of the glove. (When laying flat) LENGTH, TIGHT or LOOSE depends on your arm circumference. .. These Womens Above-The-Elbow Length(12BL) Velvet gloves are one size fits all because of the stretch quality and easy to wear and comfortable. This is a slip on glove, there are no buttons. Approximately 19.5" in length from the tip of the middle finger to the end of the glove. (When laying flat) LENGTH, TIGHT or LOOSE depends on your arm circumference. .. 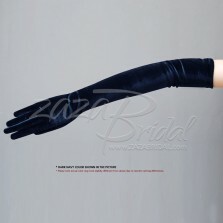 These Womens Opera Length(16BL) Velvet gloves are one size fits all because of the stretch quality and easy to wear and comfortable. This is a slip on glove, there are no buttons. Approximately 23.5" in length from the tip of the middle finger to the end of the glove. (When laying flat) LENGTH, TIGHT or LOOSE depends on your arm circumference. .. 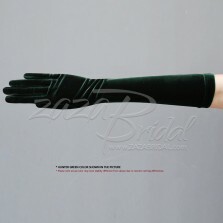 These Womens Gathered Stretch Velvet Dress Gloves(14BL) Velvet gloves are one size fits all because of the stretch quality and easy to wear and comfortable. Can be scrunched down or pulled up to adjust the length. Approximately 15" in length from the tip of the middle finger to the end of the glove. LENGTH, TIGHT or LOOSE depends on your arm circumference. .. 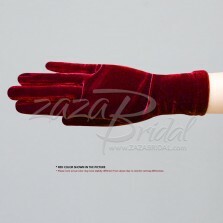 These Womens Wrist Length(2BL) Velvet gloves are one size fits all because of the stretch quality and easy to wear and comfortable. This is a slip on gloves, there are no buttons. Approximately 9.5" in length from the tip of the middle finger to the end of the glove. (When laying flat) LENGTH, TIGHT or LOOSE depends on your arm circumference. ..